Three-phase wiring for 230/460V AC power with 1/2 hp. to 2 hp. ratings and 900 - 3600 rpm. Genuine Baldor replacement 1/2 horsepower 3-phase motors are great for pumps, conveyors, machine tools, and gear reduction motors. Wired for 230/460V AC power. Power ratings from 1/2 hp. to 2 hp. and 900 - 3600 rpm. Our 1 horsepower 3-phase motors are genuine Baldor replacement for pumps, conveyors, machine tools, and gear reduction motors. They are wired for 230/460V AC power with power ratings from 900 - 3600 rpm. 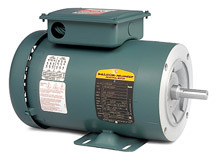 Genuine Baldor 2 horsepower replacement three-phase motors for pumps, conveyors, machine tools, and gear reduction motors are wired for 230/460V AC power. Power ratings from 900 - 3600 rpm.